The basics of security and management of software have not changed. But the new computing environment – mobile devices, cloud computing and virtualization – requires new approaches to familiar challenges. A changing economy has many of them stepping up the number of customer audits. As organizations deal with these software licensing challenges, they also face increasingly sophisticated security threats that continuously morph, just a step ahead of remedies to stop them. 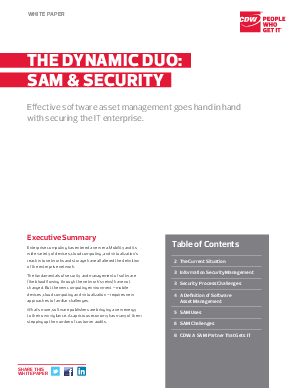 This white paper will examine the interconnection between SAM and security, offering practical advice on how enterprises can protect themselves and where to go for support.